Photograph(A), film (B) and typewritten history (C). Photo-10" x 8", film 5" x 6 3/4" (catalogued - 9/23/47) The James de Fremery Home (18th & Adeline) "James DeFremery Home, 18th & Adeline, Oakland"; (see 26.1274C, article on DeFremery home, regarding use of home and grounds as a park and recreation center) Bibliography: "Material prepared for Miss Mott of the Oakland Public Museum" From the Oakland Tribune, Sunday, May 9, 1999; from the column "Landmarks", page local-3, by Annalee Allen. The James De Fremery family home was located at 18th St. and Adeline in Oakland. The property was part of the Rancho San Antonio land grant. James De Fremery, a native of Holland, bought the property in 1867. Mr. De Fremery was the founder of the San Francisco Savings Union, and built a spacious home for his family, including his son James, and his daughter who later married J. L. Van Lobansfels. Mr. De Fremery continued to add both foreign and domestic trees and plants to the estate until his death in 1899. 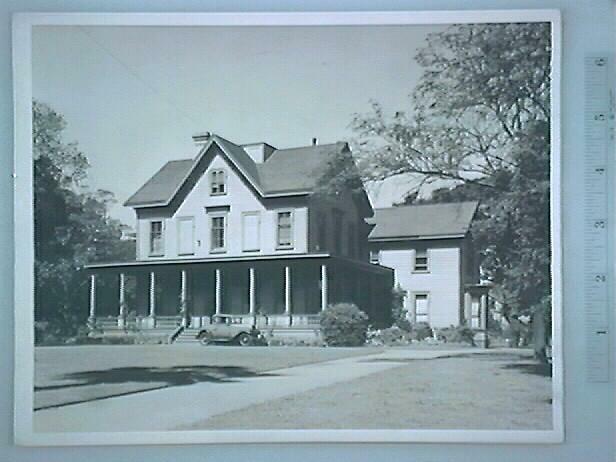 The Oakland Park Board purchased the estate in 1907 for $13,500.00. The house serves as the De Fremery Recreation Center within the park. De Fremery Park is one of the oldest public parks in the City of Oakland. A bond issue was passed by the voters in 1910to raise funds to purchase the property. The nine-acre estate was known as "The Grove" due to the lavish plantings of oaks, acacias, palms, magnolias, and other tree species. According to the Tribune column of Annalee Allen, James , born in Holland in 1826, arrived in San Franciscoin 1849. He became involved in the founding of the Savings Union Bank, a forerunner of Wells Fargo Bank. The original property Mr. De Fremery acquired extended from 14th to 22nd Sts, between Adeline and Kirkham in Oakland . In addition to the 24 room house, there were various out buildings including a large stable and a windmill. After Mr. De Fremery's death in 1899, members of the family continued to live in the house until its sale to the City in 1910. This fine example of a Gothic Revival house has been used as a community cultural center, housing valuable programs, services and activities over the years.